While I live in La Mesa California (adjoins San Diego) now, I lived in Phoenix for many years. 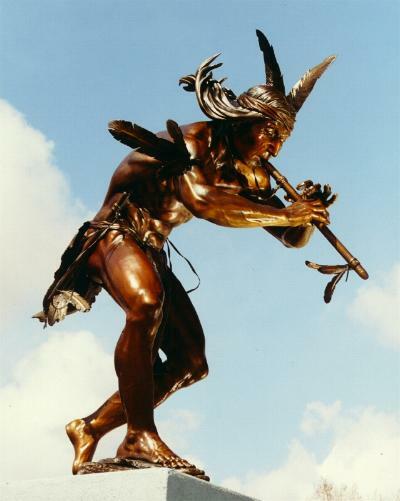 I am sure there are places where the southwest motif is prevalent, such as Santa Fe New Mexico, but few places embrace the heritage of the local Indians more than the metropolitan Phoenix area. Additionally, I worked for the Arizona Game and Fish Department who had jurisdiction over things like wildlife, including game and non game and their feathers. Kachina Dolls are Native American Indian art that represents the spiritual messengers that include the sun, rainbows, health and abundance. They are often adorned with feathers and if those feathers are of a protected species, it would be illegal. Todays dolls are made with the same care but with feathers that are beautiful, suitable and legitimate. With Thanksgiving soon upon us, I am giving homage to the people who first inhabited this beautiful land we call America. 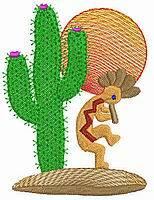 I have selected Kokopelli as my Kachina friend for this year's activities. The first picture is a life size bronze statue that sells (wholesale) for $120,000. If that is a little more than you would like to spend, you can always pick up an embroidery design for a little less. Kokopelli dates back over 3,000 years ago when the first petroglyphs were carved. He is not only considered to be a prankster, healer and story teller, but he is also known as a fertility god!! I always thought he was dancing, but upon investigation, I found out that he was a hunchback flute player. He was said to venture between villages bring spring to the winter-weary areas. I can almost hear spring within the sound of the flute. It was also said that he roused the villagers to dance and sing to his flute all night long. Upon the dawn of the next day, all the village maidens were with child. Hmmm. . . I think I like him as the prankster, healer and story teller. If you decide to do a design on a lightweight table runner, don't forget to give the design enough stabilizer to support it. The fabric should not need to do the work. It is better to use multiple layers (yes, sometimes even three) of stabilizer rather than one heavy piece. Be sure that you cross them at 90 degree angles to create a stronger base. You all know that I am an avid fan of the stabilizers that are available here at AnnTheGran. They are high quality and the best part is that they are very cost effective. See my blog on costs of stabilizers and know that I have good reason to love these stabilizers. From Dakota Collectibles there are some wonderful southwest designs. In Phoenix, it is common to see the red hot chili pepper designs around for the Christmas holidays as well. Not to be outdone, Embroidery Studios has a great Indian Spice Collection. It is exclusive to AnnTheGran. Bring something new to your Thanksgiving table this year, embroidery showing your appreciation of the natives of this nation. I am going to use mine as a place mat for the turkey platter or I might just make it a wall hanging. If you missed your email on Wednesday, it was just so full of good information, great holiday projects and terrific deals. Check out the Home Page to see what is happening! Hi, I saw on an older (2009) that you have a source here in SD for iron on tricot. Does it still exist and could you pass the info on? Thanks in advance, Bee. And I like Kokopelli also! That life size one would look great in my garden!! I am leaving a comment here as my problem is related to Native American Designs. I purchased the "Pueblo Children" design set from Ann the Gran in 2002. Unfortunately my computer, back-up discs, embroidery machines, stash and everything were stolen. I loved these designs and used them often. I wanted to buy the pack again and found that they no longer appear on the Ann the Gran site. In fact the whole site is different. It looks just like the Embroidery Designs.com site now. I called the ATG phone number and got an extremely rude woman who said I should have made backups! That "Vendors" change, etc.. I re-emphasized that Ann the Gran WAS the Vendor and where were the designs for sale now. She said she couldn't help me. Do you know where I can repurchase the "Pueblo Children" pack? Is it still possible to re-download them from the ATG site? I sewed them all over my lab coat when I worked as a nurse in Taos and the patients loved them.